I’m often asked about girls in STEAM – how to get them in, why they quit, why don’t more stick with it. There are as many answers as there are girls! At Fire Tech we have lots of girls who love tech and who love to use it to solve problems and express their creativity. Some girls are super happy to join any class and do it for the love of the subject. But we get a lot of calls from girls and their parents who want to be sure that they aren’t going to be the only girl in the class. We have about 28% girls overall (up from 22% when we wrote this post) so it’s rare that you would be the only girl, but it’s also not uncommon that there two-thirds of the class boys. An exception to this is our Python class, where we frequently – against the common wisdom – see 50%+ girls in our courses. And we see how much fun they have together. We do observe that for some girls, it’s just a lot more fun if there are other girls to socialise within the class. We decided to offer a few #AllGirls courses this summer. An All-Girls Teen Coding with Python course and a #AllGirls: Robotics With VEX IQ course. The point of this is not to segregate the girls from the boys and of course girls can join any class that they want. We don’t want to offer “pink” classes that focus on subjects that reinforce stereotypes about girls in STEAM. What we want to do with this is offer some classes where girls know before they sign up that they’ll be in a group with plenty of like-minded girls. #AllGirls has a second meaning, too. We think that #AllGirls can enjoy tech if they have a chance to explore it in an engaging and supportive environment. We plan to staff those classes with bright young women wherever we can so that the girls in the course have a chance to speak to someone just a few years older who is pursuing a technical degree. 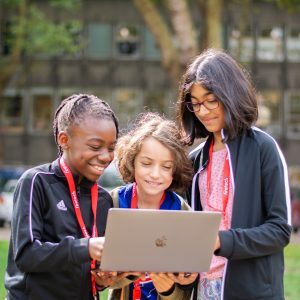 We want to see #AllGirls give tech a try so that they can get their arms around the latest tools to create, communicate, and change their world. Sign your daughter up for one of our #AllGirls courses, and use your refer-a-friend code so that she can bring a buddy along. Check out the #AllGirls offerings for this summer!